Olympic great Sir Ben Ainslie added the America's Cup to his illustrious CV, after a remarkable comeback by Oracle Team USA. Ainslie became the first British sailor to be aboard a winning America's Cup boat since 1903. 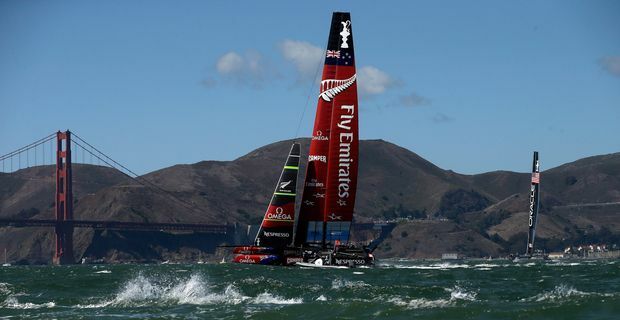 It capped a remarkable comeback from the Oracle team that had trailed Emirates New Zealand 8-1 after the first nine races, before levelling the scores and taking the race into a climactic showdown in San Francisco Bay. Ainslie had been in a similarly daunting position at the London Olympics in 2012 and had won gold on that occasion. This time, he was the tactician and inspiration for an international crew that included only one American. He was seen driving the team to victory with some very British instructions: "This is it. This is it. Work your arses off." It capped an astonishing comeback. "Oh man, oh man, what a race!" Oracle's Australian skipper, Jimmy Spithill said. "It was a fantastic race. We wouldn't have had it any other way. To come from behind, these guys just showed so much heart. It really is about the team. I am so proud of the boys. We were looking down the barrel of a gun." New Zealand had invested heavily in their team in the hopes of bringing the race to the Antipodes. With a seemingly insurmountable lead, the Kiwis thought they had it in the bag, although they neglected to factor in Ainslie's peerless competitive spirit. The Oracle team had changed personnel after the initial setbacks, the most important recruit being Ainslie, brought in as tactician to replace the Californian local John Kostecki. When it came to winning the America's Cup, Oracle team founder Larry Ellison had little time for sentiment or national pride. The American was out, the Brit was in. After the dramatic finish, the New Zealand Prime Minister John Key summed up his nation's reaction with a succinct one word tweet: "Bugger".